Weddings are very important and most personal events in every couple’s life and wedding album is considered to be the most sacred book in their lives to relive those beautiful moments even after years. Now wedding couples hire a wedding photographer to document their special day to just to get few staged poses of their wedding that too created after the event in some studio. Those magical and enchanting moments are riveted by a wedding photographer. An expert of capturing a story and giving it a unique dimension. Wedding photography is a way of not only capturing the couple but also giving their happy moments a life which they can cherish forever. Unlike regular pictures, wedding photography is a specialized form of photography, not just to capture wedding ceremonies but to give those emotions and moments a timeless effect which couples remember for years to come, and so. Gone are the days when no much importance was given to the wedding photography and the requirement of a wedding photographer was barely important, where on the name of wedding photography the wedding ceremonies and the participants were captured. Today, wedding photography has evolved to an absolutely new dimension, as the wedding photographers now know that there is more to wedding photography than just taking some few colorless pictures of the wedding. Wedding in any couple’s life is most important event, a new beginning for the couple and their near and dears. Today, the role of a wedding photographer is not just limited to clicking few regular pictures of a wedding but to capture the emotions, the joyous moments and beautiful memories of these two people stepping in their new life. 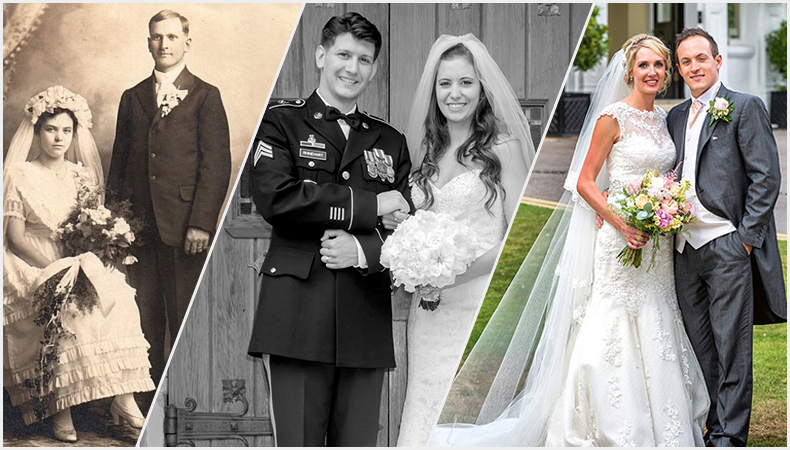 Take your grandparents wedding pictures and take your friend’s grandparents pictures also, can you see any difference, I don’t think you would be able to see any difference except the faces of people who are pictured. Now take an album of your elder sister’s wedding and your cousin’s wedding album do you see any similarity? I don’t think except few same guests, everything else will be different even the photography will also not be same. As today, even the wedding photographers have their unique and different style. Maybe the one who clicked your sister’s wedding was a photojournalist whereas the one who captured your cousin’s wedding is an expert of an artistic wedding photography. You must have heard this quite a lot time “change is the only constant” and same applies to the wedding photography also, nothing is same as it was few decades back. Every day a new gadget and app is introduced in the market taking photography to downright new level. Unlike old photography style, photography now is an art and the wedding photographer is an artist. The idea of evolution has worked perfectly well in almost all the spheres, so in wedding photography industry as well, from a labored wedding couple carefully posing in the studio to one walking hand-in-hand to the stage. Change is inevitable we all know that, learning to adapt to changes is an art of growing and staying abreast with the pace. Those who fail to adapt the changes fail to survive in the market and such is the case of wedding photography industry too, which has changed dramatically in the last few decades from increased number of pixels in a picture to documented couple’s wedding photographs. Photographs are no longer detached from what really happened in the event. Wedding photography has evolved and went through various changes, procedures, experiments and methods from just colorless wedding photography to colored wedding photographs, photojournalism to documentaries and so on and so forth. These photojournalists’ have become more creative and advanced. Wedding photography now is akin to documentaries because wedding couples want their pictures to be showcased as real. Time has changed and with time everything around has changed including the photography in wedding industry. How you ask? Read on…..! Now wedding photographers have access to new and unique photography tools and equipment. Only after the Second World War photographers were exposed to new and hi-tech cameras and gadgets. Back then photographers used to a studio with beautiful sceneries in the background where the bride and the groom had to stand or sit in a standard pose and get their pictures clicked to have those pictures as their wedding memories. It was not even in everybody’s pocket to afford, no filters, no editing tools no artistic processes were available then. We all know what globalization is and how it has affected the overall economy of any nation, photography is also one such industry which is positively impacted since globalization. Things in wedding photography industry have changed dramatically after the globalization. Now the wedding photographers have much to explore and showcase their creativity. Today, photographers are able to create a masterpiece from a simple photo shot. 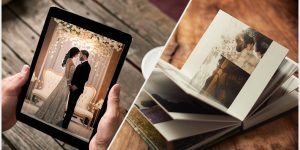 It’s easy for the couples now, to get their customized pictures and wedding albums their so-called best memories of the event. Only with the invention of hi-tech cameras it was possible for the wedding photographers to take candid pictures of the couples, otherwise it would have never been possible for the photographers to their job as majestically as they do now. A dramatic shift has taken place in few past decades, which is a gift to the wedding photographers and for the couples who want to have memorable pictures of their big day. Unlike age-old photography today photographers have access to various types of photography gears, tools, equipment which not only make their task easy and comfortable for them but also help them to make couple’s big day memorable, as their wedding is once in a lifetime event. Even the role of the photographers have changed now for him what really matters to him is to take beautiful wedding photos involving lot of effort, creativity and the knowledge. 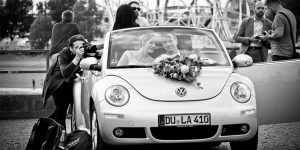 Wedding industry is now a vast segment unlike the industry few decades back, having various styles of wedding photography from traditional to reportage wedding photography, documentary to aerial wedding photography, artistic to vintage wedding photography, classic to fashion wedding photography, and so on. Earlier was the concept of having seated wedding pictures posed in the studio and photographers were skilled in that only now each photographer has his own style. Now they are more creative, able to put in different elements of photography in a wedding shoot, know-how and use of various gears make them create magical and mesmerizing photographs of the couple. Earlier few shots of the newly-wedded couple along with few participants were captured to have the memories of their wedding, but now there are so many aspects and elements of a wedding, captured by the photographer from bride’s make-up to groom getting ready, venue to entertainment, outfit to shoes, food to decor, portraiture to group photography likewise. Every element is interconnected to another in a wedding and so none can be left or ignored in a wedding now. Every detail of the big day is captured to create beautiful memories of the couple. The best thing in evolution of photography is people are becoming sensitive about their wedding photographs and wedding albums as they find it the most important part of their wedding. Hence, in order to get best memories of their wedding, they don’t mind paying any amount for hiring a professional photographer to capture most important event of their life. This is a good sign altogether in the wedding photography industry. Unlike old days when only few posed photos of the newly labored couples were shot that too in the studio set-up. Now wedding photography industry is swamped with various types of wedding shoot besides the main event like engagement shoot, pre-wedding shoot, indoor wedding photo shoot, and outdoor wedding shoot and so on. Unique and beautiful way of telling a story of couple’s life. With the advancement in technology, introduction of new and various platforms clients these days are well – versed, they know exactly what they want. 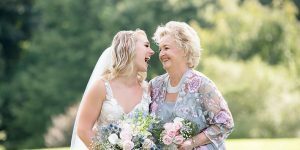 They are no more like old age couples who were shy and were happy with those stilted pictures showcasing artificial emotions of their big day. Today’s couples are communicative, and clear about their requirements it sometimes make photographer’s task easy and often becomes a trouble for the photographer (troublesome when the client behave bossy, or start to behave irrational at times). They do not like to just sit in one position and let the wedding photographer directing them for a pose, in fact they come up with their own ideas, sometimes very innovative to get themselves clicked on the biggest event of their life. Today ‘customer is regarded as king’ and to deliver the best of the services is mandatory for a wedding photographer so as to stay abreast in the wedding photography industry. Today when clients are technically well-versed, the moment a couple gets his wedding dates first thing they start with is the search for the vendors and the wedding photographer is one of them. Their choice and taste for wedding photography has changed and improved to another level, now they look for the wedding photography that stands out, an absolute different style of photography to shoot their big day. Now their approach to their wedding photography is more of artistic, cinematic, candid and romantic images featuring all the details like outfits, decor, lighting, and scenes all in line with the modern aesthetics, technically well executed with concurrent post-production. Gone are the days when people used to place their wedding pictures in any album for that matter. Now people are sensitive about their wedding photographs and about their wedding albums as well. Now these photo albums are not just wedding albums but a place where couple’s big day’s beautiful memories are sealed or housed for their lifetime to cherish those memories whenever they flip their album. Multiple cover choices, many decorative and stylish wedding album styles, in different sizes large and small are available to select from. Wedding album these days is a unique way of telling a couple’s story and couples do want to have the best story of their relationship and their big day. Today with the availability of modern technology it’s not only a photographer who reach out the client but client also reach out the photographer upon seeing his/her work or gallery online. With the modern marketing method it is easy for a photographer to get clients, if a wedding photographer has a knack for wedding photography, and he is present online, his gallery speaks on his behalf unlike old days where a photographer has to reach out people to get work. 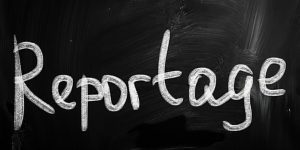 Various methods of promoting oneself online either through ads, blog posts, blogs, etc., are available. Now clients search wedding photographers based on their requirements and style of photography they are looking for their wedding. Today multiple online options are available to showcase your wedding photography, market it and acquire clients further. Initially it started with Facebook as in the years 2013 and 2014 Facebook was popular, now other options like websites, blogs, Instagram, Guest Posts, promo videos, email marketing, Gigs on Upwork, Fiverr, Freelancer and so on and so forth. Now the market is replete with options and you just need to be attentive and abreast with the pace the wedding photography industry is heading forward. If you are one of those wedding photographers who only depends on clients coming to your studio directly and booking then chances are that you are missing on clients on other platforms. It is like mandatory today to have your online presence where you can showcase your work and get clients. Whenever you have some special offer you can send it across to all your existing clients over the email to target them for some other photography requirement of theirs. Online media has also evolved exponentially with the evolution. Now the wedding photography industry business is not limited to studio itself, by and large it has also evolved with the evolution of wedding photography. Now wedding photographers are able to build rapport with their clients and that’s how they get referral business. Wedding photographers are either get the business or do not get the business as word of mouth is your best friend, and if your work is not up to the mark then word of mouth can be worst enemy as well. Unlike old days when people were empathetic, they were strong enough to forgive you for your mistakes and technology was also not advanced hence to err was okay back then. But today clients are very smart, less patient, highly demanding, they look value for money and if at all something goes wrong from your end, you have not lost the client but also the potential business too. So, it is not just advisable to fool your clients. Instead treat your client precious, spoil them. Take very good care of the timeline, their requirements and needs, DO NOT at all let them have any bad experience on their big day or otherwise also. Then you see you are their family photographer for the lifetime…. Bingo!! Referrals through fellow vendors is another way to get business today which was not the case long back. Now people are more business oriented and they know if they will help you today on some business, surely you will help them tomorrow, it’s like give and take sort of business strategies. Various avenues are available to market your wedding photography today and one is paid directories where in you can put in all your details, your prices, your imagery as when client will research about a photographer your details will flash on the screen and therein they can scroll through your imagery and can directly contact you to take things further. Yes, that is, with the affordability of cameras and all the gears many photographers are taking birth almost on daily basis. People are passionate about photography now. Even the gadgets we use in daily life has nice cameras and therefore many people find their passion for photography. But with the increase in number of wedding photographers the competition is also increasing on daily basis. It is cutthroat competition now and increasing every day. Not only this but also other photographers don’t hesitate to badmouth each other to get the client. Once you are successful, you have to be extra cautious as there will be many people around you to tear you down. The only advice for you is don’t give up, accept the change and stay tuned!! Hence, several changes has occurred in the photography in wedding industry, wedding photography industry has evolved and is still changing swiftly, and those who withstand change will surely find themselves out of the race soon. For those who adapt the changes and are willing to go with the pace for them “sky is the limit”. Latest is drone wedding photography and likewise changes will keep on happening, as change is inevitable. Don’t be rigid as rigidity can cost you too much, be flexible. But for the matter of fact, beyond all changes what matters the most is your style and the outcome you present to your client after putting in lot of efforts and hard work simultaneously and your willingness to adapt those changes and be more creative and effective to your clients. Weddings are pricey affairs and today’s couples are way too smart, be incredibly passionate and creative to spoil your client to have them back to you for their other photography requirements. At the end what matters the most to the client is the quality of your work and the value for their money. A very nice and old saying by C. JoyBell C. for you all to benefit yourself upon adapting the change…! !